Deploying any video wall or digital signage installation requires careful planning around how to connect sources to video wall equipments and graphics cards to screens. High quality cables can be sizable and difficult to manage, especially when installers are managing large bundles of cables from a video wall controller to a bank of screens. Many long range solutions require additional power at both the transmitter and receiver end of the solution. Datapath's ActiveConnect series solves all these problems with a single DisplayPort to DisplayPort fibre optic cable that is available in a variety of lengths up to 100m. The ActiveConnect cables are 7mm thick and require no additional power. They can provide a direct connection from the Datapath ImageDP4 to a DisplayPort capable screen. The ActiveConnect cables are only 7mm thick and are available in lengths up to 100m. The weight of the cable equates to approx 15 grams per meter (including connectors). Each cable has a minimum bend radius of 6mm allowing cables to be manoeuvred around obstacles with ease. 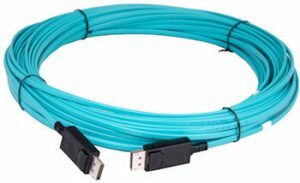 The Datapath ActiveConnect cables are available with DisplayPort1.2 (3840 x 2160p @ 60fps) and can be used to connect a 4k media player to Vision capture cards or from the Datapath ImageDP4 graphics cards to DisplayPort capable monitors or projectors. Each cable is HDCP compliant allowing for protected sources to be carried within the Datapath system. The ActiveConnect cables do not require any additional power when used with the Datapath graphics cards and multi-display products and, at 7mm thick, installers can easily deploy large numbers of screens using cables that take little space. Each cable is PLenum rated and can be safely installed into building cavities such as walls, floors and ceilings. *Please note that 50m and 100m cables are shipped on spindles for ease of deployment.